Kaszëbskô Jednota and Kashubian Development Institute together with Radio Kaszëbë invite you to celebrate Kashubian flag. We propose 18th August to be the Kashubian Flag Day. Thanks to the Rompski family, who provided us with free premises at the Gdańska Street, we were able to open congress office. Above the office proudly fluttered a golden-yellow flag with the Black Griffin. (...) The Committee decided to display a second Kashubian flag – black and yellow national flag. This provoked an immediate response from local authorities. Vice-starost, Mr. Paźniewski, sent officers with orders to remove these banners. At that time, all of a sudden, for a moment I felt weak and helpless. I turned to Jan [Trepczyk]: - Now What? What to do?- What to do? These are our flags, Kashubian. We will not allow for these flags to be removed, even if we have to fight in their defence with the entire Kartuzy police. Kashubian symbols have the right to exist on Kashubian land. I looked into his eyes and for the first time I saw in them the real John with all his determination. They were beaming with energy, will power and determination that I thought to myself: such eyes might have belonged only to the Napoleon at Austerlitz. His will power has spread onto me immediately. I was ashamed of my momentary weakness and helplessness. At that moment Mrs. Frania, sister of Dr. Majkowski, came into our office advising us not to remove the flag, but instead to hang out the Polish flag next to the Kashubian. We did so and for the time-being local authorities gave us a peace of mind. The Congress Day was scheduled for Sunday, 18 August 1929. Today no one calls for the black-yellow Kashubian flags to be removed from the streets. Quite the contrary. They are proudly flapping in the squares and in the offices of the Kashubian towns and villages, decorating our homes during the national celebrations and public holidays. We have never displayed it before just to celebrate the Kashubian flag itself and as a symbol of national ties connecting Kashubians. In the census of 2011 229 000 of us declared sense of belonging to the Kashubian community. Let's do it again – on 18 August of this year by displaying our flag by the office, home or on the car! Special car window mounted flags will be distributed from Wednesday 8 August to Friday 17 August (or until stock runs out) by Radio Kaszëbë and by our campaign sponsors in their offices: "Miras Auto Repairs" in Pępowo and "AutoSzulc", second-hand car dealer in Sierakowice. 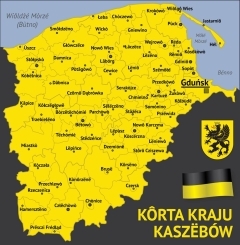 Let's hang out the black and yellow flag on 18 August, the Kashubian Flag Day. Let us show that we are a proud nation, conscious as a community inscribed in the heritage of Baltic Europe.